Gauge Industrial and Environmental provide potable, industrial and waste water treatment plant maintenance and improvement services. This also includes cooling water evaluation, treatment and management of scale, corrosion and microbiological control, and advice on the sourcing of the correct chemicals for process water applications. We deliver professional assistance for an array of industrial processes. With decades of experience we provide expert advice and determine the best solution for your industrial application. We provide complete water cycle management solutions, chemical support, chemical analysis, chemical dosing systems, chemical trial development and operation, microbiological analysis and scientific problem solving and quality improvement. 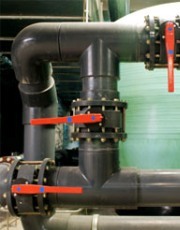 Gauge Industrial and Environmental provide microbiological testing and problem solving. We sample, analyse and determine the root cause of microbial issues and provide advice on specific treatment options. We assist in the selection, manufacture and testing of treatment options for microbiological issues in industrial and mining settings. Our science team perform evaluations of chemical performance, suitability for intended use and the most efficient applications strategy. We apply rigorous science to seek the most efficient products and treatment options and provide practical advice to our clients. Gauge Industrial and Environmental deliver expert scientific advice and assists customers to respond to complaints regarding dust, noise, water, noise and odour. This involves investigating the scientific nature of the issue. We provide analysis and solution to the problems and assist customers to liaise with complainants where appropriate. We assist clients to maintain legal compliance and negotiate with administrative authorities. We provide compliance reporting, monitoring plans, TEP negotiation briefs and technical advice regarding Environmental Authorities and licences.